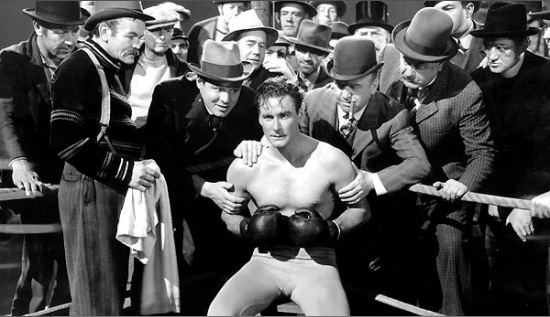 To kick off my week of rediscovering some Errol Flynn films I thought I’d start with his bigger than life performance as James J. Corbett that seemed to suit Errol just fine. Here we get Flynn displaying his cocky and brash persona as a social climber. While trying to win over well to do Alexis Smith he finds himself at the local fitness club and trying to impress anybody within ear shot puts on a set of boxing gloves and does well enough to impress trainer Rhys Williams. Flynn is very quickly alienating the club members with his annoying habit of trying to over impress everyone so the senior members decide to teach him a lesson hiring a professional boxer to smack him around. No such luck as Errol has foot work that must have inspired Muhammad Ali. From here Flynn along with pal Jack Carson for his corner man and William Frawley as his new found promoter is well on his way. Utilizing fight posters, newspapers and train wheels as a way of moving the plot along we have Flynn rising in the world of prize fighting to a position where he poses a threat to John L. Sullivan played wonderfully by Ward Bond. Using his cocky attitude to his advantage he needles Bond into agreeing to a fight for the Heavyweight Championship with the winner claiming the purse money. You don’t have to be a boxing historian to know who is going to win this epic battle. Alan Hale has always been high on my list of character actors to enjoy. His role here as Flynn’s father is a joy to behold. He would co star with Errol in a number of films over the years including his turn as Little John in The Adventures of Robin Hood. Hale was a true scene stealer and I mean that in a good way. Flynn favorite Raoul Walsh directed this film with a fast paced delivery and delivers the goods in the staging of the numerous fight scenes throughout the films 104 minutes. Walsh would direct Flynn in a number of films including the controversial Objective Burma where Flynn was unfairly attacked by the press for winning that battle all by himself. Walsh also is responsible for giving us my favorite Cagney film, White Heat. I don’t pretend to know how far this film strayed from the facts of Corbett’s life but that doesn’t concern me because the film is a classic example of what the studio machine could put together with the right actors and director. Don’t miss this one if you haven’t seen it and it’s a great intro to Errol Flynn if you only know him as Robin Hood. 5 Days of Errol Flynn starting Tomorrow! hear hear! 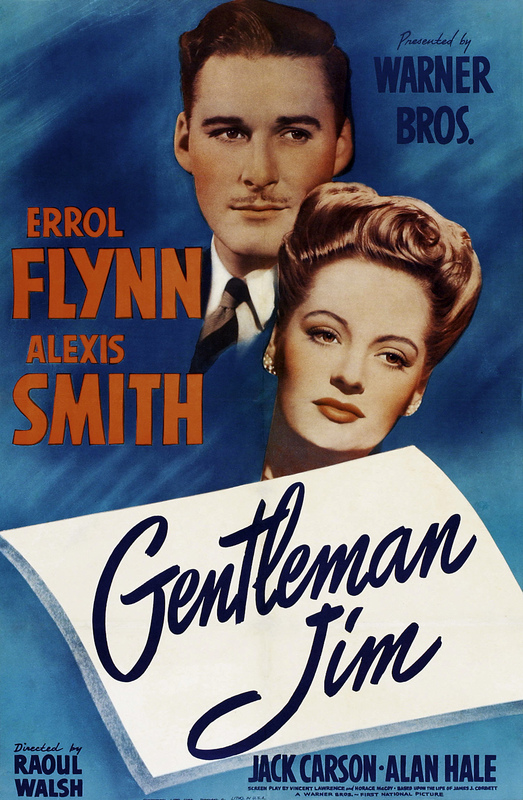 Agree so much on this movie, such a great classic and one of the best showcases for Flynn and the other men. Don’t know if you plan to cover Objective Burma so I won’t jump on that one other than to say I really like it too. and many thanks for the Ward Bond link; he bought the rights to play Sullivan again, but nothing came of it, too bad. This is a good one to start a flynn festival. I won’t be doing Burma simply because I have seen it too recently and in keeping with the idea I wanted to re-discover some that I haven’t seen in far too many years. Bond was great in this and one could argue a Supporting Oscar nod. Would have been nice as he never really got a sniff of any awards that I am aware of. We have talked about Bond many times so wanted to sneak your great essay in there. A perfect role for Flynn – all the charm and athleticism are on show. And I couldn’t agree more on Bond. That scene at the end is probably as good as anything he ever did. Flynn really looked at home here for sure. Although I haven’t seen it in years I recall Bond being memorable in a film called A Man Alone with Ray Milland. I’ll have to revisit that one. Yes indeed! That’s a real neglected gem with good performances from everyone.